Sony made a big splash with the introduction of its new 2/3-inch 4K camera at its NAB press conference. 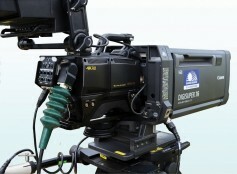 With the emergence of high-resolution (2K, 4K) single-sensor cameras in 2006 (Red Digital Cinema was first), many claimed that television production and digital cinematography would never revert to three-chip CCD cameras—the workhorse since RGB prisms made their way into video cameras—again. The significantly lower prices of these cameras, and their shallow depth of field acquisition capabilities, high sensitivity and dynamic range took the documentary and motion picture by storm. However, as live production companies began testing them on major sporting and entertainment events (mostly funded by consumer electronics manufacturers like Sony), it soon became clear that while image resolution was improved, shallow depth of field and the difficulty in maintaining focus when shooting fast-moving action was not ideal for the types of long shots (some cameras are typically mounted high up inside stadiums for wide panoramic views) sports producers had become accustomed to. A number of image artifacts were also apparent when panning large crowds. Also, with little demand, production companies don't see the need to invest in new cameras without a clear return on investment. And as of today, there isn’t one. So, sports production companies stayed with their familiar three-chip HD cameras and, due to a lack of demand, didn't push into 4K as eagerly as one might expect. In fact, there are currently only two 4K-capable trucks in the U.S. They did embrace single sensors to produce extremely high-quality HD slow-motion replays from a 4K image, but these were not the “main’ cameras of an HD production. However, caught up in the 4K frenzy that is being driven by CE manufacturers looking to sell the next generation of televisions to consumers, traditional professional production vendors see an opportunity to sell new cameras and, at this year’s NAB Show, most of the major camera suppliers showed new models that use three 2/3-inch sensors to produce a 4K image (that is, Ultra High Definition, or UHD, at 3840 x 2160 lines of resolution). UHD—as opposed to “True 4K” at 4096 x 2160 lines—is favored by broadcasters because of the smaller file sizes is represents. The 2/3-inch form factor allows production companies and broadcasters to use their existing HD widezoom and long telephoto lenses, which is a big attraction across the market. Indeed, the use of existing HD lenses eliminates the need for special conversion adapters and drops the cost of 4K productions considerably. The new “3-chip 4K” cameras, like Grass Valley's LDX Universe, are already showing promise in studio productions, where fast motion and bright sunlight is virtually non-existent. Among the companies that supply the live production equipment used to produce all of the major sporting events on television, Grass Valley was actually the first to show a 2/3-inch three-chip “4K” (UHD) camera, last year at NAB 2014, using three of its Xensium-FT CMOS HD image sensors. 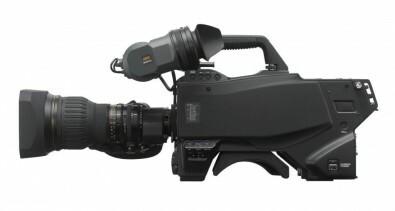 This prototype demonstration was well received and prompted first Hitachi, and then Ikegami, and Sony, to announce similar 2/3-inch B-4 lens mount cameras this year. Like Grass Valley, Hitachi’s new camera uses three 2/3-inch HD chips, although adds a fourth (including two “green” sensors) to produce its UHD image. Both Ikegami and Sony showed live production cameras with three UHD-native chips. The new “3-chip 4K” cameras are already showing promise in studio productions, where fast motion and bright sunlight is virtually non-existent, like at CBS Television City, in Hollywood (Los Angeles), California, where various shows, like “The Young and the Restless” are shot. Called the LDX 86, Grass Valley’s new camera uses three 2.5x2.4 mm (2/3-inch) HD sensors and software-based architecture to enable sports producers to use the camera as a 4K camera one day and an HD camera or Super Slo-Mo camera the next. Grass Valley said the same high sensitivity and dynamic range performance is available in all formats and these different options are enabled with software licenses that can be purchased for weekly or monthly use. 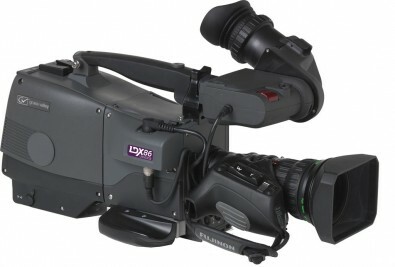 A fully featured LDX 86 is called the “universe” version. The Mobile TV Group (MTVG), based in Denver, Colorado, is one of the first to embrace the new camera, committing to buy several over the next few months. 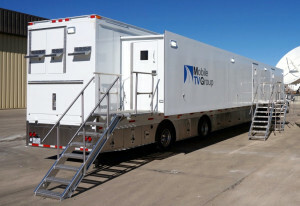 MTVG recently rolled out its first 4K mobile production unit, and the second (Total Video has one also, which was parked in the Sony booth at NAB) in the country. MTVG’s mobile unit includes Grass Valley’s 4K camera, Kayenne K-Frame production switcher with 4K capability and Kaleido multiviewers. “There is no question that Grass Valley’s development of the 4K three 2/3″ imaging camera system is a major breakthrough that is enabling 4K live sports production,” said Philip Garvin, co-owner and general manager, MTVG. Originally shown at the IBC Show in September of 2014, the Hitachi SK-UHD4000 uses newly developed 2/3-inch HD CMOS sensors configured in a patented 4-port RGB prism combined with four sensors (two being green) to deliver the 4K performance of a 35mm single color filter array sensor in a standard portable camera chassis. Hitachi said this design avoids the artifacts of color separation from the single color filter array sensors used in other 4K cameras. By employing two green sensors, the camera’s low-noise 2/3-inch MOS sensors acquire video images with no smear, high sensitivity, high resolution and increased power efficiency. Hitachi said that new developments in lens aberration correction allow the camera to correct optical flaws in even the most expensive HDTV lenses. Hitachi's SK-UHD4000 uses newly developed 2/3-inch HD CMOS sensors configured in a patented 4-port RGB prism combined with four sensors (two being green). While capturing images in its red, green, blue color components, the company said its SK-UHD4000 generates color resolution superior to single-sensor 4K cameras. Other features include independent 2K cutout from the 4K raster, the ability to switch the 4K transport stream from squared vision to 2-sample interleave, level-A/B switchable 3G HD-SDI and simultaneous multi-format (2K and 4K) outputs. Ikegami showed a new UHD camera with three true 4K sensors and a camera body that accommodates 2/3-inch lenses. Although no documentation was available as of this writing, it’s know that the camera can also output a 1080p/60 fps image and can operate in slow-motion (400-600 fps) and that it won’t be available until Q1 2016. Sony made the biggest splash with its new HDC-4300 UHD camera at NAB 2015, which also utilizes three true 4K sensors. Production groups like Bexel, Game Creek Video, NEP, CBS Sports, CBS Network, Fox Sports and NBC Sports have all committed to buying them in the next year. The sensors are a bit smaller than the HD imagers used in the other cameras mentioned here, so sensitivity is a presumably bit less, but bringing a 2/3-inch 4K camera to market within a year is impressive. The camera is set to ship this summer. The HDC-4300 features three 2/3-inch 4K image sensors while supporting the same B4-mount lenses as well as the same control surfaces as Sony’s HDC-2000 series cameras. The company’s existing HDLA-1500 series, control and shading systems, viewfinders and master set-up units are all compatible with the new 4K 2/3-inch camera. Sony said this means directors and operators can maintain their current approaches to live events—including camera angles, zoom ranges and iris settings–while using familiar camera technology. Sony HDC-4300 uses three 2/3-inch 4K sensors with B4-mount lens options. Sony said it has developed an approach that allows the existing HDC series user base to employ 4K advantages such as 8x high frame rate and 4K cut-out and zoom while using a familiar infrastructure and signal path. The HDC-4300 is capable of 4K/HD operation, with 2x, 3x Super Slow Motion as standard, and higher speeds up to 8x available, to produce high-quality replays and specialty program effects. The camera uses ultra-high-precision alignment technology to realize three 4K sensor on a new prism. This allows the support of the next-generation ITU-R BT.2020 broadcast standard’s widened color space for future-proof masters or post production options for today’s productions, shown on tomorrow’s 4K services. And although the major broadcast lens manufacturers, including Canon and Fujinon, showed new 4K lenses, with price tags that will be “reasonably more expensive then comparable HD lenses,” according to Gordon Tubbs, Vice President, Broadcast and Communication Products at Fujifilm (Fujinon’s parent), professionals are sure to use their existing lenses in the near term. So, live 4K production in the U.S. is still in its infancy. This testing will include the use of higher dynamic range in tandem with high frame rate acquisition (some say roughly 120 fps works best), which is known to improve the appearance of HD pictures as well.